Where is race in the Chetty et al. mobility paper? large African-American populations, y25;c is only 35. The main lesson of the analysis in this section is that both blacks and whites living in areas with large African-American populations have lower rates of upward income mobility. 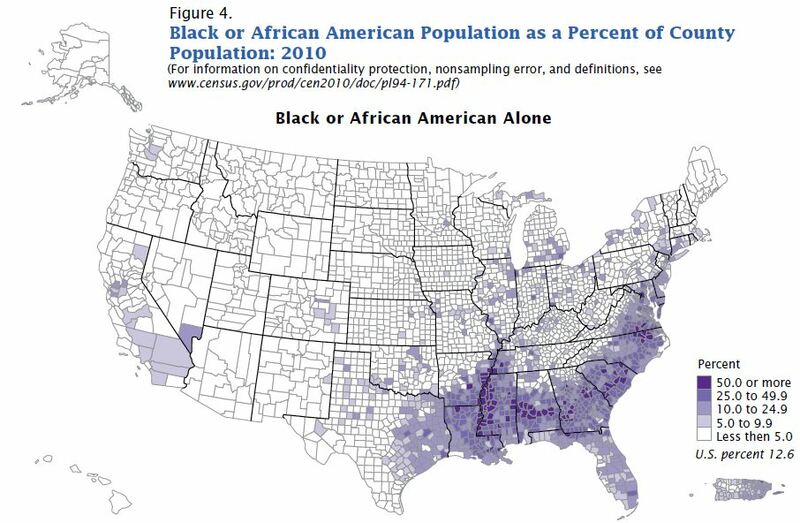 One potential mechanism for this pattern is the historical legacy of greater segregation in areas with more blacks. Such segregation could potentially affect both low-income whites and blacks, as racial segregation is often associated with income segregation. We turn to the relationship between segregation and upward mobility in the next section. Hence, family structure correlates with upward mobility not just at the individual level but also at the community level, perhaps because the stability of the social environment affects children’s outcomes more broadly. I explored the percent Black versus single mother question in a post a few weeks ago using the Chetty et al. data. 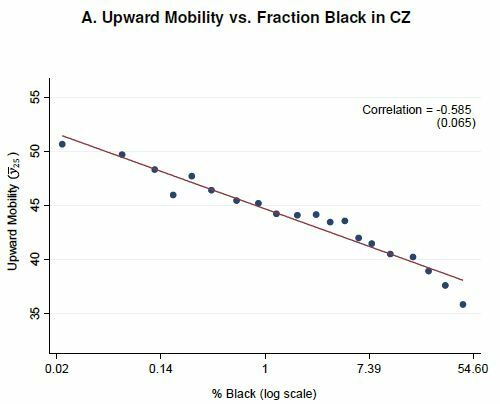 I did two very simple OLS regression models using only the 100 largest commuting zones, weighted for population size, the first with just single motherhood, and then a model with proportion Black added: This shows that the association between single motherhood rates and immobility is reduced by two-thirds, and is no longer significant at conventional levels, when percent Black is added to the model. That is: Percent Black statistically explains the relationship between single motherhood and intergenerational immobility across U.S. labor markets. That’s not an analysis, it’s just an argument for keeping percent Black in the more complex models. Substantively, the level of racial segregation is just one part of the complex race story — it measures one kind of inequality in a local area, but not the amount of Black, which matters a lot (I won’t go into it all, but here are three old papers: one, two, three. The burgeoning elite conversation about economic mobility, poverty, and inequality is good news. It’s avoidance of race is not. Angela Hattery and Earl Smith, E. (2007). “Social Stratification in the New/Old South: The Influences of Racial Segregation on Social Class in the Deep South.” Journal of Poverty Research 11(1), 55-81. Earl Smith and Angela J. Hattery. (2010). “Cultural Contradictions in the South.” Mississippi Quarterly Vol 63 (2): 145-166. Since social mobility is closely related to educational attainment it is no surprise it is lower for African-Americans. This data is specific to poor parents. 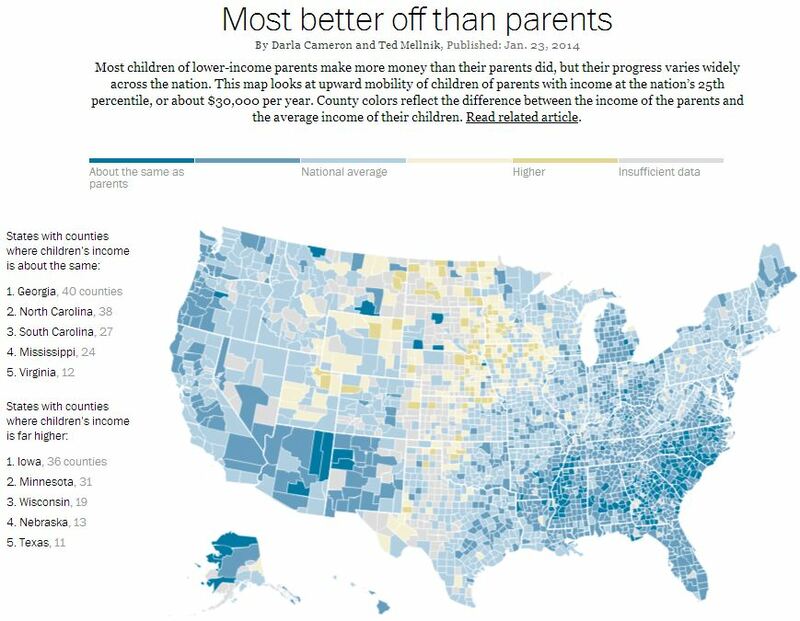 The y-axis numbers, typically in the 35-50% range, actually show a pretty decent social mobility across the board – it looks like more than half of these born-poor kids achieve middle class income no matter the place they lived. So, many of the conclusions made by the authors, have to be understood with this caveat, i.e., 35-50 is not improvement to one percenter territory, but it is not the same as getting worse. The way the curve is plotted, I cannot predict waht happens when the percentage black is > 50, buu I guess Y25 is < 35, but I dont know how much. 2. What is rich is Dr.Cohen chastising Chetty for not looking at percentage black, but with 1964 glasses on, he skips over the larger minority. The biggest minority in the US is Hispanic with 17% of the population, but 22-25% of the children. The impact of segregation on Hispanic mobility can be easily identified by a trip to South texas, East LA, or locally to Takoma Park. What I am saying is that we need to decompose these results to at least three populations, and plot against percentage of each group. And that is the crux of the weakness of most soci-economic analyses showen here; the lack of details by population. You’re right about Latinos but miss the point for this analysis: the problem with not having Black in there at the individual or community level is that it is so strongly correlated with single-parent families. So, in my view, I suspect that racial inequality (lots of mechanisms) causes single-parent families, which affects social mobility. And when you leave race out you inflate the effect of single-parent families. I think you are taking my criticism too much to your heart. I am only supporting what you are saying by mentioning that if you add Latino percentages and unmarried latino mothers to your analysis, you will reduce the association between single motherhood rates and immobility even further. https://familyinequality.wordpress.com/2013/12/30/inequality-mobility-single-mothers-race/ was an important contribution; i could not do the same because I could not find the race percentages by “Commuting zone” (What the hell is that? How did he get results by commuting Zone). However, noting that the birth to latino mothers has attained 53% in the 2000s, and that more Latino children (911,000 vs 583000 black children) your analysis will be strengthened. Ya, that’s odd. Maybe the bins look more correlated, but they calculated the correlation off the full data, which is messier? Still. It’s Galton 101: The black income mean in lower than the white income mean, so blacks in the bottom quintile regress toward a lower mean than whites in the bottom quintile. Basic regression toward the mean explains why this map looks like a college football recruiting map of where the best high school cornerbacks are found.